A clear protective coating that can be applied to vulnerable exterior surfaces including concrete, brick, stone, render, timber, metal, cladding and most sound previously painted surfaces to make them easily cleanable, repeatedly without re-application for up to 20 years! The product has excellent adhesion properties on both timber and steel. It easily applied and comes in a single pack and is available in gloss or matt finish. 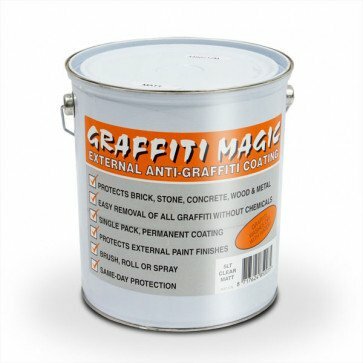 Graffiti Magic Clear Anti-Graffiti Coating is a quick-drying, anti-graffiti paint which protects suitable substrates against graffiti of all kinds and can be cleaned repeatedly without special chemicals. Its an easily applied, single pack, clear coating available in gloss or matt finish, giving excellent adhesion to recommended substrates. Short drying and re-coating times mean rapid graffiti protection of all kinds can be achieved. Graffiti Magic Clear Anti-Graffiti Coating can be applied to vulnerable exterior surfaces including concrete, brick, stone, render, timber, metal, cladding and most sound previously painted surfaces. As Graffiti Magic Clear Anti-Graffiti Coating preserves the substrate in the condition in which it is treated, cleaning and/or re-decoration must take place before treatment.